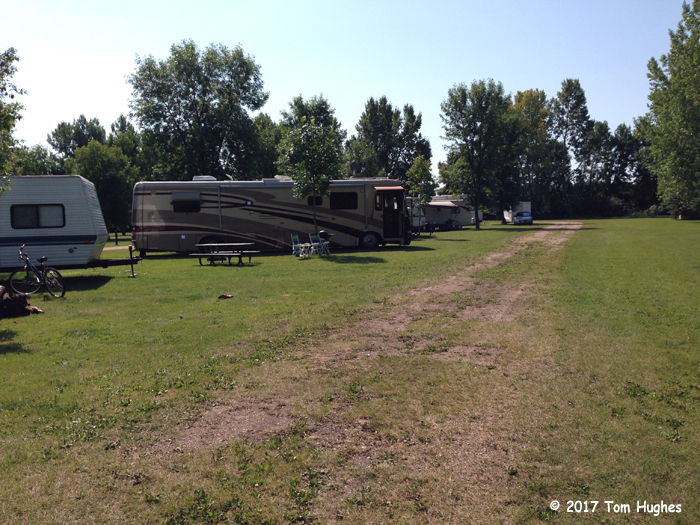 We’re finishing up a week in the Larimore Dam Recreational Area, and it’s been a very good camp site. Above all it’s been inexpensive — $125 for a week in a full hookup, pull through site with WiFi access. That’s cheap. Spending an entire season would only set you back about $1100. Despite being almost full, this campground has been one of the quietest we’ve ever stayed in. Good camp neighbors too. The week here also gave us time to fix our TOAD lighting system. Tomorrow we’re off to Minot, ND and then Montana where we plan on spending Labor Day. We’re too far north, Kath. I hear it’s impossible to get a campsite anywhere near the path of total darkness.